This cocktail has a lot of things I like. It’s old. It has Rye, absinthe and screwball ingredients (Peychaud’s bitters). Oh, and it’s a good cocktail. 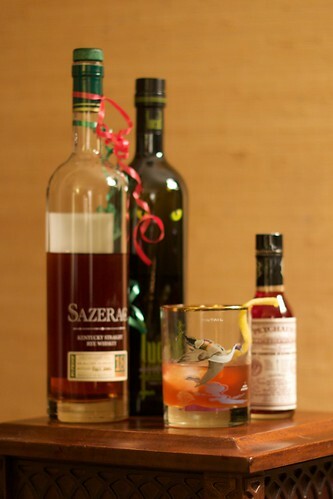 According to David Wondrich in Esquire Drinks, the cocktail takes it’s name from the from the Sazerac de forge et Fils congnac with which it was originally made before the Civil War. On this note, Ti Adelaide Martin and Lally Brennan, in their book In the Land of Cocktails: Recipes and Adventures from the Cocktail Chicks, claim that the switch to rye came when phylloxera wiped out the grapes in France, making cognac hard to get in this country. They also make the bold, though perhaps slightly un-Southern, assertion the would rather use cognac than bourbon if rye isn’t available. I agree. Chill a rocks glass well in the freezer. In a second rocks glass, muddle the sugar cube with a few drops water. Add a few ice cubes. Add the rye and bitters. Stir well. Add the absinthe to the chilled cocktail glass and swirl to coat. Drink any of the absinthe doesn’t stick to the glass (you’d be surprised by how many cocktail books proffer the idiotic advice to pour out the left over absinthe). Strain the cocktail into the absinthe coated glass and garnish with a twist of lemon. A couple of my thoughts… I think a fresh ice cube or two keeps the drink from getting warm (heresy to Sazerac drinkers). If you haven’t lost all control of decorum at that though, a splash (less than a couple of ounces) of seltzer from a soda siphon (outright blastphemy to Sazerac drinkers) really makes this drink a bit more approachable. Okay, I now can’t go to New Orleans without risking lynching, but there you have it. A special thanks to B for her stellar photography of this cocktail (and a fair number of the others that I didn’t mention). P.S. If any of my readers prefer beer to cocktails, and happen to be going to Oshkosh, Wisconsin, be sure to check out Riding the Tavern Beer Trail, where you can read about the exploits of my in-laws and their friends as they drink a beer in the 60+ taverns in Oshkosh. A few places locally and the one place I ordered one in New Orleans (I had others at Tales, but only one at a bar proper) use instead of a sugar cube (about 1/4 oz simple) use a full ounce of simple syrup to 2 oz rye to make the drink more approachable. A good rye can handle that much sweetness, but it still is a different beast. Luckily, there are places here in Boston that can make it properly. A number of cocktail books, including In the Land of Cocktails, call for simple syrup. I would think that it would make for a more consistent cocktail and would be much faster in a bar. The muddle sugar cube give a kind of weird, though not unpleasant, effect of the drink subtly changing in sweetness as you drink it. It’s the same effect you get with an old fashioned. Glad to know there are good places to get these in Boston. I would guess this drink would be a pretty good test for a bar. If they can make this without adding grenadine and raspberry schnapps, you are at a descent cocktail bar. I like that one of the steps in the recipe is: ‘Drink the absinthe’. I can’t believe people would pour it out!